Faizal is a ten year old student. 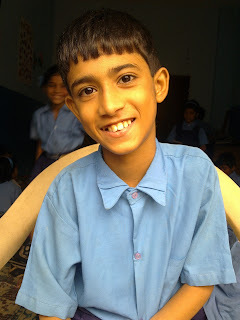 He is studying in the second standard in the HOPE worldwide School in Tigri. His father Mohammad Hakim is a painter. Faizal was very sick when he was small; he learn to walk when he was eighteen months old. When he was three he became very ill. He was not able to walk properly again. His parents were not able to show him to any good hospital because of their financial problems. Finally Faizal’s uncle decided to take him to a Mumbai government hospital. But Faizal still couldn’t walk properly; he can’t even get up after sitting down. Now he is ten years old and he would like to study more. He can’t walk properly but he still reaches school regularly.